At the same time that the acidosomes fuse with the phagosome, the DV-I membrane, that originated from the discoidal vesicles, is transformed into tubules that are removed from the phagosome. By this process the DV-I is transformed from a phagosome into a phagoacidosome (DV-II), a process of apparently “total” membrane replacement. (For discussion see Allen et al., J. Cell Sci. 108:1263-1274, 1995). The mAb to antigen Q2 specifically labels the tubules that are being removed from the DV-I. 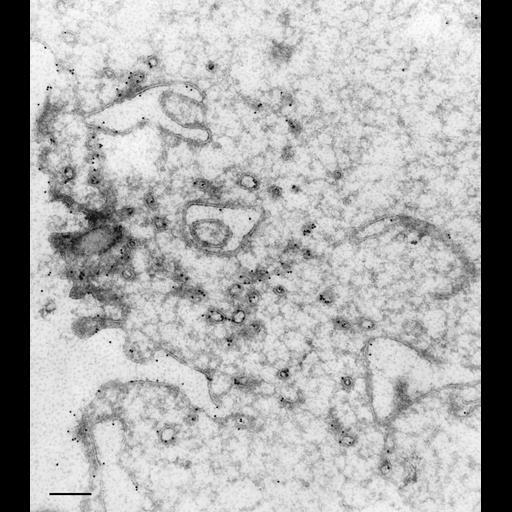 TEM taken on 9/18/93 by R. Allen with Zeiss 10A TEM. Neg. 12,000X. Bar = 0.5µm. Part published in J. Cell Sci. 108:1263-1274, 1995. Adapted with permission. To label membranes inside the cell we used very lightly fixed cells (0.25% glutaraldehyde) that were then rapidly frozen in liquid nitrogen and sectioned later at -100oC. These frozen sections were picked up on drops of methylcellulose and transferred to a Formvar-supported grid. The sections were immunogold labeled (15nm gold) to show the location of the specific antigen inside the cell as well as on the cell surface. Microtome sections prepared at approximately 75nm thickness. The negative was printed to paper and the image was scanned to Photoshop. This image is suitable for qualitative analysis. A high resolution version of this image in the library (CIL:40558) which is available for quantitative analysis. Additional information available at (http://www5.pbrc.hawaii.edu/allen/). J Cell Sci. 1995 Mar;108 ( Pt 3):1263-74.